Loved this book. It’s written in verse so it’s a quick read, a couple of hours of uninterrupted time will take you straight to the end. 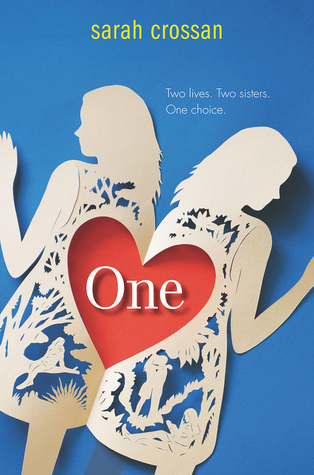 Anyway, “One” focuses on a unique topic I’ve never seen in fiction before: the lives of conjoined (or, “Siamese”) twins. Due to this fact, Tippi and Grace (I love their Hitchcock-themed names, btw) are typical teenage girls that share vital organs and have never attended school–until now. This book follows them on their first day at school and beyond, on their quest for a sense of normalcy in their lives. However, Tippi and Grace’s home lives are no picnic. Their dad is a drunk, their sister has body issues of her own, and their family has little money, which leaves the family with the difficult choice of deciding whether or not to allow a film crew in their home to document Tippi and Grace’s lives. Eventually a dire medical situation arises with the twins’ health and they must decide whether to stay “one” or be separated. I won’t reveal the end, but I will say that this book was a definite tearjerker. For me, it says a lot about a novel written in verse, because I typically like my fiction to read like fiction, with neat little paragraphs. However, this book was special. There were passages I found myself reading aloud because they seemed to leap right off of the page. Beautiful writing. I rated this four stars because this book isn’t without its flaws. For one, it is narrated completely from Grace’s point of view, which is somewhat of a end spoiler. A dual narration probably would have kept the suspense going at least until the middle of the book. Second, it just kinda…ends. You never find out what happens with many different aspects of the story that seemed to be quite critical. I definitely recommend this book. And bring a box of tissues.